Kefir is a unique fermented milk drink, more correctly healthy food, used for generations in Asia and revered for its health promoting properties. Real kefir can be produced only by traditional methods at home and only from original grains. These original grains, slightly yellowish "cauliflower" like things, are cca 5000 years old bacterial culture originating either from the Caucasian Mountains or monasteries in Tibet. These real kefir grains are complex symbiotic colony containing more than 35 probiotic bacteria proven highly beneficial to humans. In the Caucasian Mountains is a legend Mohammed gave kefir grains to the Orthodox people. The "Grains of the Prophet" were guarded jealously since it was believed that they would lose their strength if the grains were given non-believers. Kefir grains were regarded as part of the family and tribe's wealth and they were passed on from generation to generation as a well-guarded secret. For millennia, the people of the Caucasus enjoyed this healthy drink without sharing it with anyone else they met. Some other people from the West occasionally going to the Caucasus region heard strange tales of this unusual fermented beverage, which was said to have 'magical' properties on wellbeing. Even Marco Polo mentioned kefir in the chronicles of his travels. However, kefir was unknown outside the Caucasus for all the time until the end of nineteen century when news spread of its successful use for the treatment of tuberculosis, intestinal and chronic diseases. At this time Caucasus region was under control of Russia and the Russian doctors working there had first hand experienced that kefir was greatly beneficial to human health. Professor Dr. Kanschlikow devoted a large part of his life to kefir research and in 1893 published first scientific study of the healthy effects of kefir. Although Russian working in Caucasus were able to occasionally drink kefir, kefir grains were impossible to get. However, the members of the All-Russian Physician's Society were determined to obtain kefir grains in order to make kefir available to their patients, and developed plan to get kefir grains. One young and beautiful girl, Irina Sakharova, was given this mission. She was sent to Kisslovods and then to the court of a local prince, Bek-Mirza Barchorov. She was instructed to charm the prince and persuade him to give her some of the best kefir grains kept in their ruling family for centuries. Unfortunately, it didn't go according to plan. The prince, fearing retribution for violating religious law, had no intention to give away any "Grains of the Prophet". However, he was very taken by the beauty of young Irina and didn't want to lose her either. After some adventures and dangers, Irina succeeded and in September 1908, she returned to Moscow with a cup of real kefir grains. Today, most of the real kefir grains around the globe, are babies of Irina's original cup of grains. Smaller kefir grains originate in Tibet and are common among kefir lovers too. You may be familiar with commercial "kefir" available in some grocery stores; that's an enhanced version of buttermilk, NOT the real kefir. Many attempts were made to produce kefir commercially; all have a long way to go to be close to the real kefir. The real thing with uncountable health benefits, is still ONLY the traditional home brew made from the original Caucasian kefir grains of Irina - but you can not buy these grains in any store anywhere. They are NOT for sale. The original Irina's grains are kept alive and cared for with love by a devoted group of people. These people believe that greedy humans can not imitate God, therefore, they will be forever unable to commercially duplicate the full extent of healing properties of the real kefir grains. For this reason, the real kefir grains are passed around the globe for free to whoever needs it or believes in it - it is like a chain love letters from one person to other person - with love and wishes of good health. However, although the grains are free, you pay symbolic price of $15.00US for 1/4 of a teaspoon - it is an appreciation for previous care, cost of milk and/or shipping. This graceful attitude is to honor the original belief that humans have no right to monetary gains from the true gift of God. * ALWAYS USE ONLY CLEAN AND CLEAR PLASTIC OR GLASS CONTAINERS, CLEAN PLASTIC OR WOODEN SPOONS AND CLEAN PLASTIC OR BAMOO STRAINERS! From experience of generations, here are some of the properties possessed by the real kefir. * Regulates the body's immune system and improves resistance to diseases. * One 1.00->1.50 liter mixing bowl with opening similar to the diameter of strainer. The best is raw goat milk from certified organic farm. However, pasteurized cows milk with 2%-9% fat content, works also fine. There is also possibility to produce non-milk kefir, but that's another story. You can tell by the level of coagulation. The last place of coagulation is at the bottom of the glass container; you should see curds and whey separate into layers and pockets. When you turn the container around, if the coagulated bottom moves as milk, it is not yet ready. When the coagulated bottom will be firm as a thick jelly, not much moving, it is ready. It may be tricky when without experience, but within a week or two, you will find out when kefir is ready. The longer fermentation time, the sourer the kefir is. If you are in drinking kefir for eliminating lactose intolerance, you will need to ferment close to 36H. However, never drink a kefir fermented over 48H, it provides a serious constipation! With 12H of fermenting, it works like a gentle laxative, 24H gives fully fermented balanced kefir. Overfermenting is not advisable, since kefir pH becomes too acidic and growth of grains slows. Normally, the grains tend to double in size about every 20 days. When you will have more than you need, offer some to your friends or anyone around the globe who may need their miraculous power. When you do so, always supply with the grains the Kefir Manual and ask for the symbolic monetary donation. For start, you should have about 1/4 of teaspoon of real kefir grains, either fresh or suspended for shipping. If fresh, put them in milk and they will continue to work right away. If suspended, put them in milk too, but they will work slow since there is activity recovery time about 4-7 days. If they come in winter, use glass thermometer (for children) to find their temperature. Warm 1 cup of milk (2% or 3.6%) to the same temperature (that's why you have cooking thermometer) as the grains have. Add to the milk a pinch of unrefined cane sugar, mix to dissolve. Pour the warm milk to the glass container and move carefully the grains there. Cover the glass container with a lid, and place it to a warm (22-25C) and slightly dim spot. Again, every few hours shake gently the glass container. When the whey and curds clearly separate on the bottom, proceed as above. This second batch is drinkable. However, the right kefir will come after the first 4-6 batches. For the first batches, the ratio between grains and milk should be 1 part of grains to 20 parts of milk. Later, when your grains will adapt to their new home and your love, you may achieve ratio up to 1:60 for 24H fermenting. With all the next batches, follow the above procedure. In principle, always return about 1/2 of the kefir back to the glass container (don't forget the grains!) and add the same amount or more of milk warm between 20-22C. Those of you, who are into kefir drinking for eliminating candida overgrowth, may be scared to death learning that kefir culture contains also candida yeast. Don't panic, all is OK! The candida yeast in kefir is a vicious cannibalistic sister of the infamous Candida albicans! In addition to it, the kefir culture contains host of other microorganism and all of them eat Candida albicans 24H per day. All available scientific research and uncountable personal experiences confirm that drinking kefir will free you (with no side effects) form burden with candida overgrowth. This leads one more bit of information - yeast in kefir produce CO2 gas and with tightly closed or locked lid, the fully filled container may explode. If you wish to use very tight lid, never fill the glass container more than 2/3 of its volume. With a tight lid, you get carbonated kefir. With lose lid, you get flat kefir. Small glass, 3/4 to 1 cup daily, preferably after the evening meal, is a common prevention drink. 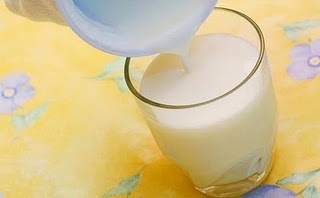 Kefir is not only special nourishment, but also a special medication. If kefir drinking is intended for treating serious diseases, it is advisable to change diet to living foods, then detoxify and cleanse the body, liver, kidneys and bowels. This greatly increases effects of healing properties of kefir. For candida overgrowth or general disorders of colon, take 1 cup first thing on the morning and 1 cup one hour after supper for 3 days, then for 3 days take no kefir. Apply this on and off regime for 3-4 weeks. If no relief was obtained, you may gradually double dosage and continue for 3 months or more. However, even when you will have kefir pause, the grains don't pause. You must regularly milk the grains and feed them as if you would need to drink the kefir! For generations, the people from Caucasus give kefir to newborns as a substitute or addition to mother's milk, they also drink pure glacial water; breath unpolluted air, eats living foods and thickened kefir as bread or dessert. Their verified life span in a full physical and mental acuity, lies between 110 - 140 years (the last is not a rare occurrence), they have no cavities, they are free of diabetes, prostate, tuberculosis, digestive disorders, cancers and other common diseases of our highly evolved society. Clearly, prevention and living food is the best thing for health and longevity.